We are enjoying a string of very beautiful spring days. Since I'll go to the office late today, what better way to spend the morning than taking a photo hike along the shores of wooded Hinckley Lake. I imagined fog rising from the surface of the water, backlit by the low sun. I hoped for deeply blue skies. And I hoped I'd see buzzards basking in the first warmth of the day, as I'd seen once before. I got most of what I wanted and I am a happy fellow indeed. I also shot my first digital photos in RAW format, which I will play with later. Walking along the gravel path was a pleasure. I spotted a downy woodpecker up in a tree but couldn't get a clear view for photos. Meanwhile a male cardinal perched above me and gave me a stern look; I was wearing a red jacket and he probably thought I was a rather gigantic intruder! 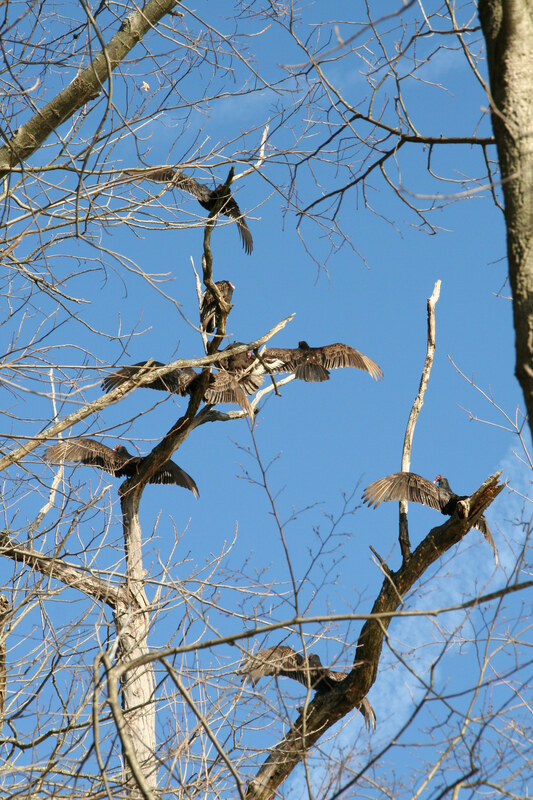 Rounding a curve I sighted them: perched all over the top of a dead tree were turkey vultures, "buzzards," basking in the morning sun to relieve the nighttime chill. The big birds watched me cautiously and some folded their wings preparing to make an escape, if necessary, as I approached and stood beneath their perch. Leaning against the trunk of a neighboring tree, I watched as some of the buzzards took short flights from branch to branch, and others to a nearby tree. As time passed the birds became more and more active, ruffling their feathers and moving around. One by one, over the ensuing quarter hour or so, the birds took flight and began soaring individually and in groups. They circled, sometimes alighting again on their tree. Once or twice birds landed on branches that could not support their weight and the twigs, without birds, came crashing to the ground. Soon all but one of the birds were in the air and moving off over the surrounding countryside. 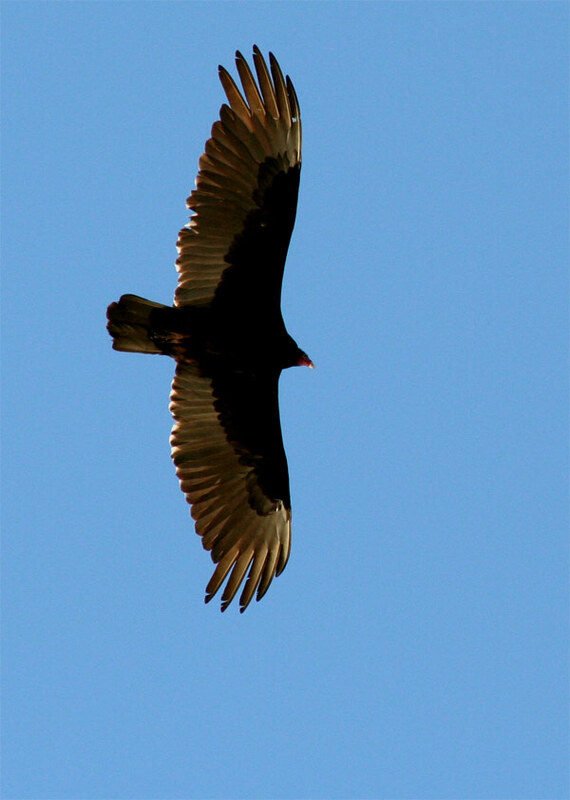 Vultures are magnificent fliers. 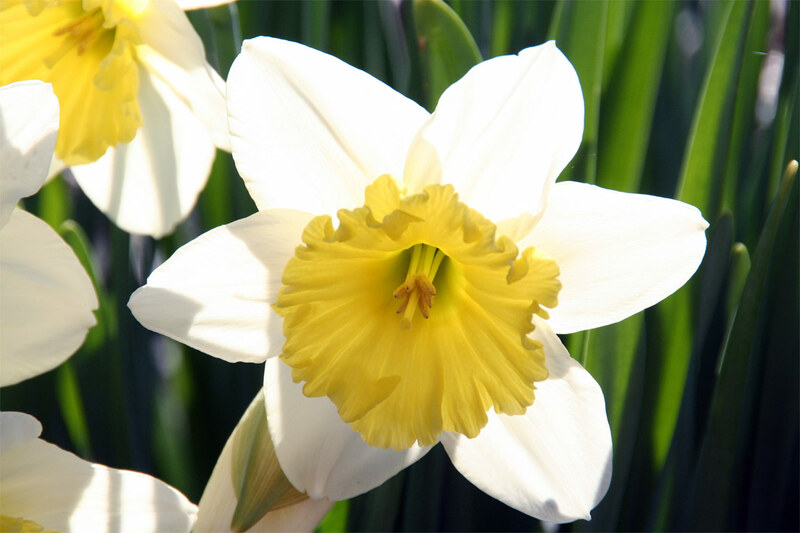 Just in case large carrion-eating birds aren't your aesthetical cup of tea, here's one last shot for you –taken from among the many bunches of spring flowers blooming around the entrance to the park and boat house– a backlit daffodil. It was a very good morning and I'm feeling better today than I have in quite some time! Unfortunately, I now must leave for work. Those "carrion eating" birds are awesome! Love the gliding photo – a magnificent looking bird! 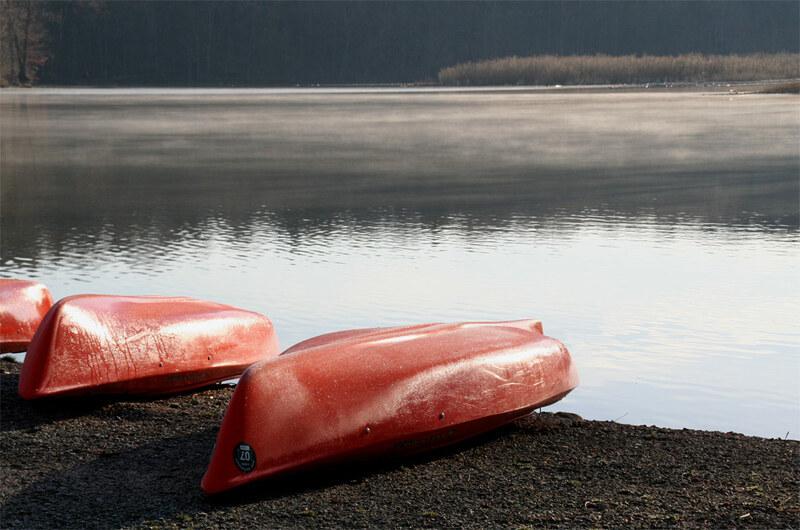 The water of the lake looks great – lucky to find some red canoes! My grandfather was a professional photographer and he always had some red things in the boot of his car to prop up his photos! I love watching soaring birds such as hawks and vultures in flight. 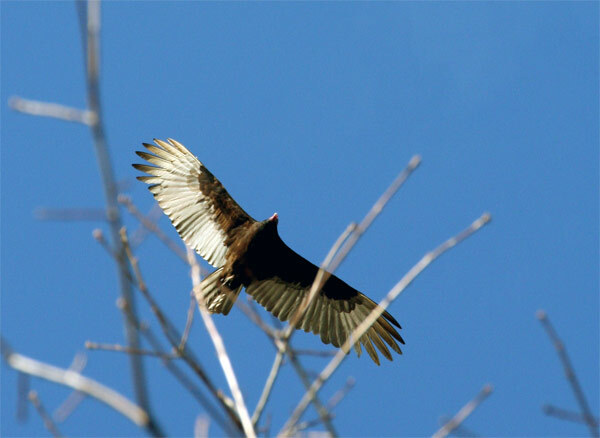 The turkey vultures are particularly impressive because of the shear size of their wing span. Being able to see them fairly close up was wonderful. I'd still like to photograph the buzzards basking in the early morning with them backlit by hazy sunlight –the way I saw them a year or so ago– but they apparently move around night to night. I'll get 'em some day!Hinckley Lake is a good one for canoing and kayaking though not very large. The lake is small, and surrounded by woodland so the water is never very rough. The water is also shallow so ducks and geese are there in good numbers as are another of my favorites, the great blue heron. Great blues are amazing to see flying and fishing — they look truly prehistoric. Images of boats hauled out of the water and laying on the shore are classic (some might say overdone) but I love those pictures anyway and I finally got a halfway decent one of my own! Really beautiful photos! Wow! The lake looks like glass and the birds are awesome. I would like to see a buzzard land on a branch and crash to the ground! That would be so interesting to see. They are really huge birds. Thanks for the compliments! I am so very happy with the photos, in general. The results give me a little more faith in the Tamron zoom lens though, if I could afford them, I think I'd rather have a small collection of Canon "L" series lenses. I'm really feeling like getting out and doing more photography these days and getting some of the best images printed. I like posting stuff online but also enjoy putting it on the wall. Just old fashioned, I guess.Branches weren't the only things the buzzards sent dropping to the ground. For more than one reason I was happy to not be directly under the flock!